A microphone is a transducer that converts sound waves into electrical signals proportional to the strength of the sound. The microphone output can be recorded or transmitted. Although there are various types of microphones, the operating principal is the same. A diaphragm, either metal or plastic, vibrates in response to a sound wave and transmits the movement to an electrical component causing an induction of an electrical current. Microphones can be classified according to the way the diaphragm transmits sound or the way they pick up the sounds. U.S. 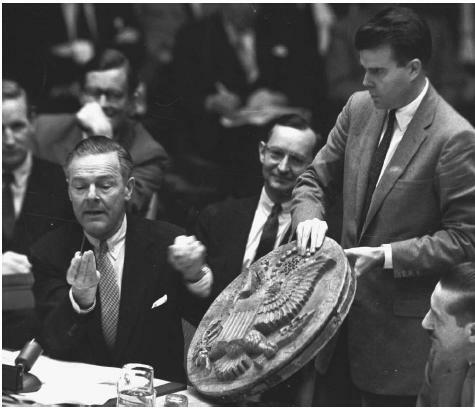 Ambassador to the United Nations Henry Cabot Lodge, left, complains to the United Nations Security Council in 1960 about a wooden carving of the Great Seal of the Unites States in the office of the U.S. Ambassador in Moscow (shown) that had been implanted with a miniature listening device by the Soviets. made to pick up sounds from various directions. There are omnidirectional, bidirectional, cardioid, hypercardioid, supercardioid and parabolic microphones. Omnidirectional microphones pick up sounds from the entire surrounding area (360°). In contrast, bidirectional devices have only a 90° pickup arc. The various cardioid microphones pick up sounds from a 105–131° arc. Parabolic microphones are the most unidirectional microphones, therefore, they have to be pointed directly at the source of sound. Their name comes from the fact the microphone itself (for example, omnidirectional) is surrounded by a parabolic dish. This dish gathers sounds and, by directing it to the microphone, also amplifies it. None of the different types of microphones is superior to the other. They are all suited for different purposes. Important factors in selecting a microphone include the sensitivity, quality of sound, overload characteristics, and, especially for surveillance and intelligence purposes, the size of the microphone. The sensitivity of the microphone is measured by an amount of current produced. The currents produced by the microphones are very small and a signal has to be amplified before it can be used. However, amplification is not selective. Not only are the sounds amplified, but also any noise that was produced by an instrument itself. Sounds that are too loud or bad placement of a microphone can lead to distortion of the diaphragm known as an overload. In any surveillance operation, placement of the microphone is crucial, not just for the quality of sound, but also for remaining inconspicuous. Microphones can also be carried by people to provide continuous surveillance or rapid identification and response. Such microphones are often combined with a transmitter or a recorder to send or record conversations. Applications of microphones. The most obvious application in security, surveillance, and espionage is to listen in on conversations. Microphones are combined with an amplifier to provide good sound quality. These sounds can be recorded or transmitted, depending on the situation or application of the microphone. They are used by individuals, police, security agencies, intelligence and counterintelligence agents. The purpose is to monitor and identify the suspects, and obtain intelligence as to their plans and contacts. The type of microphone used depends on the intended use. Parabolic microphones are used for distance surveillance as the best ones can pick up sounds from as far as 300 yards. However, most of these microphones can be easily blocked by an obstacle in the form of an object or person, causing poor sound quality or loss of sound reception. A solid wall or door would be impenetrable if it was not for a contact microphone that can intercept any audio signal through a solid material. The choices among microphones to be placed in a room or to be carried by a person are immense. A number of microphones built into pens are available. There are also microphones as small as a tiepin, allowing inconspicuous surveillance and spying. Microphones are used as security devices alone or in combination with other instruments such as fingerprint scanners, retinal scanners or passwords, to secure access to high security areas or computers. White, Paul, ed. Basic Microphones. London: Sanctuary Press, 2000. How Stuff Works. "How do microphones work, and why are there so many different types?" < http://electronics.howstuffworks.com/question309.htm > (6 March 2003). Nave, C. R. Georgia State University (2000). < http://hyperphysics.phy-astr.gsu.edu/hbase/audio/mic.html > (6 March 2003). Spy Chest. Parabolic Microphone Detect Ear < http://www.spytechs.com/listen_voice_equip/detect_ear.htm > (6 March 2003). Tan, P. Multimedia Bluffer's Guides. "Microphones" (1996).< http://home1.pacific.net.sg/~firehzrd/audio/mics.html > (6 March 2003). UCSC Electronic Music Studios. Technical Essays. < http://arts.ucsc.edu/ems/music/tech_background/tech_background.html > (6 March 2003). The University of Iowa. Multimedia Writing, Radio essays. < http://twist.lib.uiowa.edu/radio/Resources.html > (6 March 2003).